If you like trekking you’ll love rishikesh. It is situated just on the gateway to Himalaya. 5 000 meter Tops are nearby. Also, Rishikesh is world yoga center with more than 100 Yoga places and ashrams. Almost everyone does yoga in Rishikesh. Posted on January 16, 2015 January 21, 2015 Categories Travel IndiaTags ashramLeave a comment on What to do in Rishikesh? 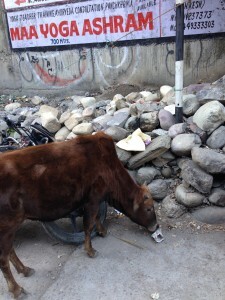 If you come from New Delhi, Rishikesh will seem like a quiet place, if from anywhere else in a world it will be a busy, noisy place full of cow manure . 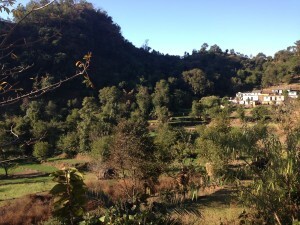 If you’re in Yoga stay in one of many ashrams, we recommend Omkarananda Ashram guest house. It has nice view of Ganges (but you need to ask for a room with the view), and a great yoga workshops. You need to book your place in advance. Parmarth Niketen Ashram is a story in itself, it is one of the biggest in India with 1 2000 rooms. It is a very noisy place. If you don’t like the 3 hours of chanting on the Ghat it’s not for you. Most peaceful place in Rishikes and the only place where you won’t be aggressively offered to buy souvenirs, hashish or anything else is a swiss cottage. Swiss cottage is a chill-out place where backpackers gather. 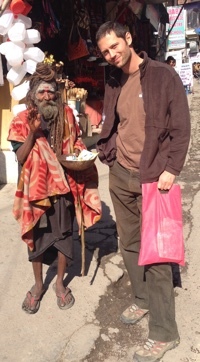 It is in a hill but only 10 minutes walk from the action (ghats, markets). We stayed at the holliday home, it is a budget place with clean rooms. Surprisingly for the price range, you get complementary water and toilet papers- you learn to appreciate such a gesture in India. 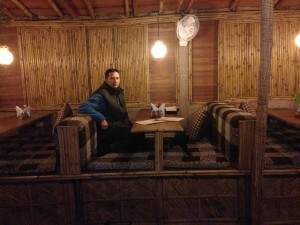 Raj, the guy who runs the place, is very friendly and he organises great trekkings like Kunjapuri Trekking. Posted on January 16, 2015 January 21, 2015 Categories Travel IndiaTags ashram, rishikesh, trekkingLeave a comment on Where to stay in Rishikesh?